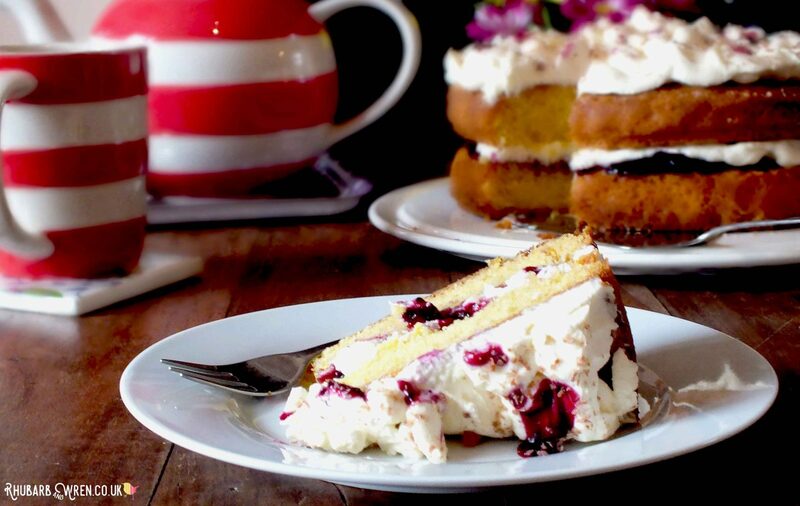 We are big fans of a classic Victoria sponge cake in our house, but this orange and blackcurrant Victoria sandwich cake variation is also a favourite with it’s hint of zingy citrus flavours, tangy mascarpone cream filling and sharp blackcurrant. It looks so pretty, it makes a great cake for special occasions too, but is really easy – and cheap! – to make. 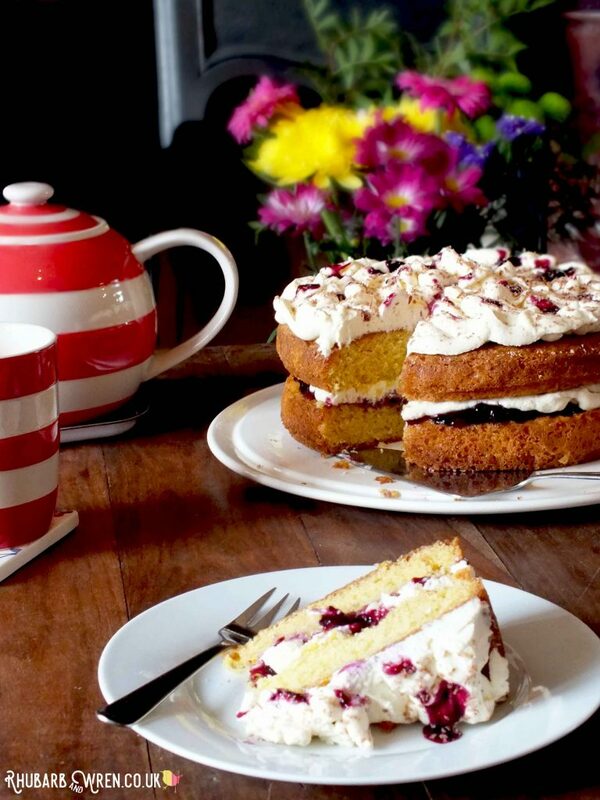 Try this recipe for our delicious take on the traditional Victoria Sandwich sponge cake. If you’ve never made a sponge cake before, you should really give it a go – they’re very easy to make, so are perfect for kids or beginners as well. The traditional Victoria sandwich uses cheap, basic ingredients that are readily available everywhere, and you can even make them by hand if you don’t have a cake mixer. 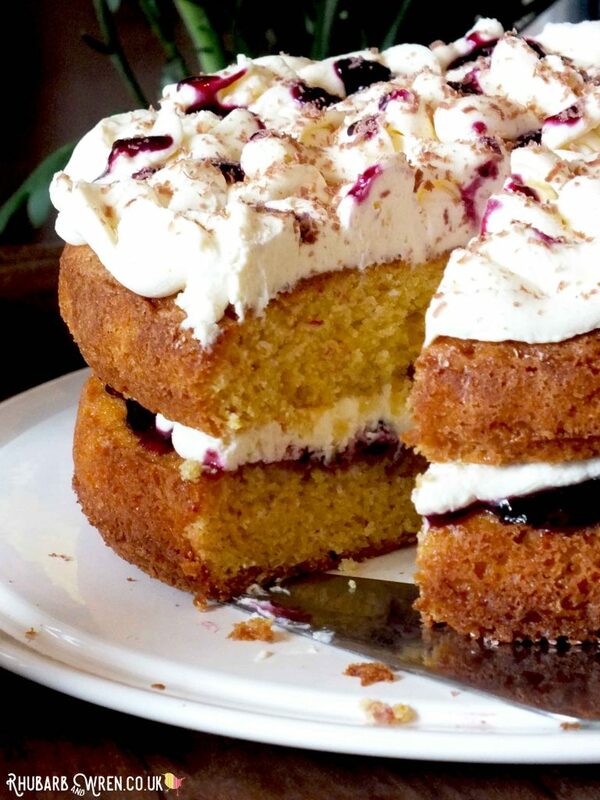 Our orange and blackcurrant Victoria sandwich cake variation uses a mascarpone cream as a filling instead of more usual whipped cream or buttercream, and adds a hint of orange to the sponge itself. Although you’d most commonly use raspberry or strawberry jam in a Victoria sponge, the sharpness of the blackcurrants in the jam used here cuts through the sweetness of the mascarpone and complements the whole cake beautifully. One slice is never enough! Rich, smooth, mascarpone cream and zingy, sharp blackcurrant jam. This recipe makes a great big cake, using two 23cm (9″) cake tins, though 20cm or 8″ tins would also work – just bear in mind the finished cake would be quite tall! 5 large free-range eggs. Weigh these (in their shells) to determine how much flour, sugar and butter to use – you need to use equal weights of each of these key ingredients, so always start with weighing the eggs! Self raising flour. If you’ve had the flour for a while, also add a heaped teaspoon of baking powder. Margarine (e.g. Stork) – you’ll get a lighter cake than using butter, and it contains much less fat. My mum and Mary Berry agree on it! 100g double cream (you can alternatively use thick or whipping cream, but I prefer the lighter mix you get with just double cream). (OPTIONAL) a few teaspoons of blackcurrant cassis or compote for decoration. 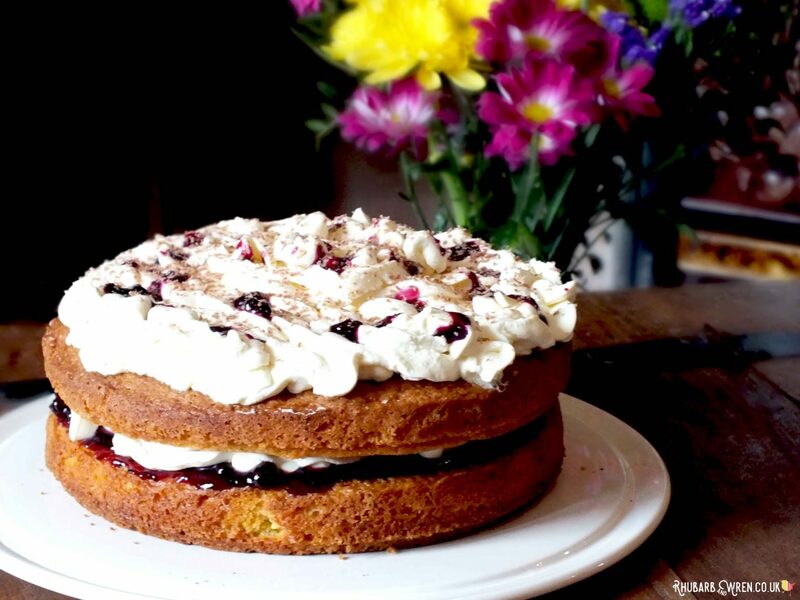 There’s no beating home-made cake – and this recipe is a doddle! Pre-heat the oven to 180° C / 350° F / gas mark 4. Grease and line two 23cm/9″ cake tins. Cream together the margarine and sugar until light and fluffy. Beat in eggs one at a time, sifting a little flour with each. Be careful to do this slowly, to avoid curdling, but do not over-beat the batter as you need air in it for a good rise. Sift and fold in the remaining flour and the zest gently, again to avoid over beating the batter. Sifting the flour helps add more air to your mix. Split the mixture evenly between the two cake tins, and pop in the oven. Leave in the tins for 5 – 10 minutes, then turn out to cool completely. ​On the slow setting for your mixer, combine the mascarpone, fromage-frais and cream, using a balloon whisk attachment. Gradually add the icing sugar with orange juice and vanilla extract. Keep speed slow, or the mix could curdle. Once all combined, move up to medium speed until stiff peaks form – the mix should hold its shape but taste very airy and light so keep mixing until you get a consistency you like (it might take a little while). If it feels too heavy – more like the texture of soft butter – try adding a teaspoon or so of milk to lighten the mix without altering the flavour. 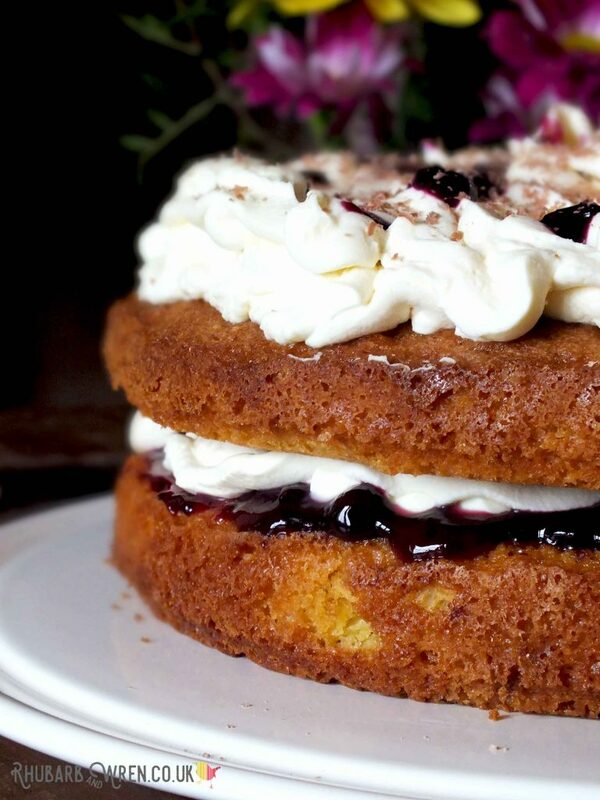 Spread your blackcurrant jam generously over the base of one of your cooled cakes. If you want to pipe your mascarpone filling, put it into a food-grade plastic bag and snip a roughly 1cm triangle off one of the bottom corners. Pipe your topping directly onto the jam in big dollops. If you don’t fancy piping, then instead spread the filling on the base of the OTHER cake. I like to drizzle a little compote or cassis onto the piped filling (inside and on top) to add a dash more blackcurrent-y sharpness, but this is purely optional. If you fancy doing this but don’t have any compote or cassis, you can make a drizzle by watering down a little of your jam with a bit of boiling water. Let it cool before drizzling over the topping though! As I happened (don’t judge me!) to have a bit of a Terry’s Chocolate Orange in the fridge, I also grated a little of this over the top to finish it off. Again, completely optional, but what’s not to like about chocolate orange on an orange cake?! 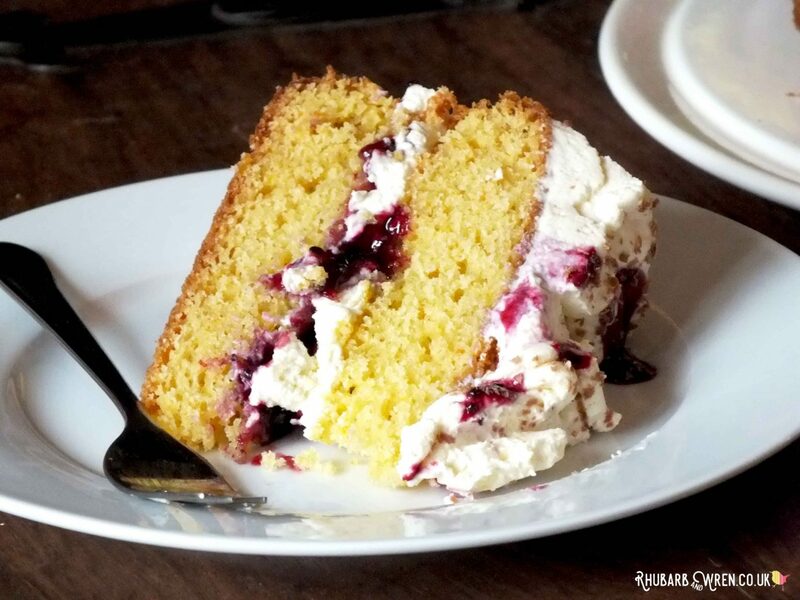 Perfect for afternoon tea – a slice of this Orange and Blackcurrant Victoria Sandwich is good enough for the Queen! Store this orange and blackcurrant Victoria sandwich cake in the fridge because of the dairy ingredients in the filling – it should be good for up to a week if kept chilled, but is best eaten fresh. Tip: piping your filling is relatively easy and requires no special equipment – it’s a good place to practice too, as it’ll be squashed under the top cake anyway! Some Amazon links to the more covetable or unusual items in this post! These are affiliate links, which means that if you click through and purchase anything, I will get a small (teaspoon-sized!) amount towards the running of this site without adding a penny to the money you pay. Thank you so much for your support – it’s what enables me to keep it going. Edible cornflower petals – so pretty! If you’ve enjoyed reading this, why not check out our other cake recipes? This impressive-looking cake is a doddle to make! Cake, Grown-up Stuff, Recipe. Bookmark.